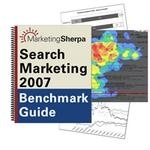 If you're involved with search engine marketing, MarketingSherpa has just released its new 2007 Search Marketing Benchmark Guide which analyzes 3,944 search engine marketing company efforts including what they spent and how their campaigns worked. The study also includes eyetracking heatmaps which indicate how ads are seen on a page and reams of data on pay per click paid search programs. Yes, MarketingSherpa advertises on this site.